Isigny Sainte-Mère butter gets all its flavour from Isigny milk, a “grand cru” of the dairy world and naturally rich in nutriments. Its worldwide reputation for excellence goes back centuries and is the result of traditional know-how, which is actively maintained in the cooperative. The world’s greatest chefs have traditionally had a soft spot for Isigny Sainte-Mère butter. For good reason, too, since this butter is both silky and supple. It remains stable when used for cooking, too, which matters to a chef! It benefits from an exceptional terroir, which extends from one end of the Cotentin peninsula to the Bessin area. A warm, temperate climate by the sea favours rich pastures in which the grass is full of mineral salts and trace elements. This natural abundance can be found in the milk, which gives a distinctive butter that has a unique perfume, suppleness and colour. 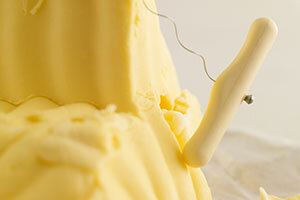 The process of making butter has changed very little down the years, indeed for centuries. It is a slow maturation in “the old-fashioned way” that allows the creams that we use to fully develop their flavour and all their organoleptic qualities. Seeded with lactic cultures, the cream “rests” for up to 18 hours, before being churned, respecting tradition to the full. Our butter is the product of mechanical work. As soon as the butter droplets are isolated, we stir them and rince them in fresh water. After a while we reach the point at which we can salt the butter. Our butter is made exclusively from cream, milk and lactic starter cultures: its taste, texture and colour comes from its natural origins and its traditional making. Isigny butter has been a recognised PDO (formerly AOC, or Appellation d’Origine Contrôlée) in France since 1986.The European system of Protected Denomination of Origin (PDO) has its origins in a French system that recognised and identified products that typified a given terroir and traditional producers’ know-how. This is an official mark of quality. 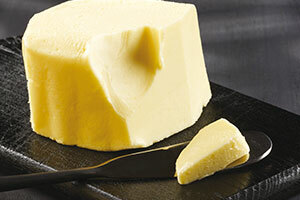 First of all, it guarantees that the butter has been made locally from authentic milk produced in the terroir. It comes exclusively from pasture-fed cows in a zone made up of 192 communes, mainly in the Manche and Cotentin départements. This rich milk has a unique nutritional profile. 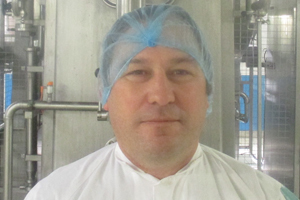 After completing a dairy industry BTS qualification at Surgères, Norbert started putting theory into practice from 1989 on the site of Sainte Mère Eglise. He started working on raw butter production there, as well as short runs of crème fraîche in glass pots. In those days, specialist short production runs were done at the Sainte Mère Eglise site. In 2004, he transferred to the Isigny-sur-Mer site and took charge of the cream workshop. Productivity, quality and hygiene are his watch words. Another subject that is close to his heart is ensuring that the correct quantities are ordered in advance. “Accurate forecasts are made to the exact month! The correct sharing out of raw materials between different workshops is essential here,” Norbert explains.